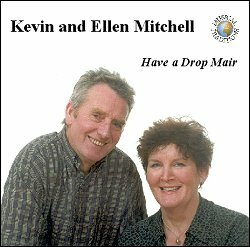 How to review this fine double CD of two remarkable singers from the Irish/West-Scottish tradition? To cover in depth the quality of the repertoires, the singing styles, the recording and production would take - as well as rather many words - the collecting, scholarly, and performance experience of the late and greatly-missed Peter Hall of The Gaugers, at whose memorial concert I last heard Kevin Mitchell sing. With a presentation of this quality it should simply be possible to say: "If you want to experience the best of what might loosely be called the traditional Irish/West Scotland ‘fusion’ then this is probably it. Buy the set." But I suspect the readers (not to mention the editor) expect something more. Of the core essentials - singers, songs, notes and recordings - let’s take recordings first. The options available were brilliantly satirised way back in the 1958 classic Suddenly It’s Folksong (The Peter Sellers Collection EMI ECC5): the ‘live’ recording (Gaelic folksinger on the corner of Sauchiehall Street; genuine Glasgow tram in background); the ‘field’ recording (revolting old English pub singers - "OOH, AAH, I Showed Her the Way"); the formal recording (of irascible Irish jug band). I am beginning to think that ‘folk’ singers are best recorded in performance, for it takes a highly experienced and relatively nerveless person not to sound uncharacteristically ‘dead’ in the studio (not to mention the aping of the Classical music boys by the snipping, splicing and sanitising via the editing oscilloscope that can follow). But such live recordings have their own drawbacks, whether the need for numerous forays or the gamble of whole recordings ‘in concert’. For there can be too many intrusions, and as a result ‘atmosphere’ gets thrown on the cutting-room floor - microphone thump, passing Glasgow trams, sundry crashing of glassware and all. Rod Stradling seems to have hit on the best way of putting over these two singers - by using ‘informal’ or back kitchen types of ‘live’ recording sessions during which everyone was clearly able to relax and give of their best. This sort of success, of course, depends greatly on the singers themselves (not forgetting the skill and personality of whoever is making the recording). The Kevin Mitchell I’ve seen in the flesh performs with a charming, relaxed modesty - as though he has just come off the Stranraer ferry for the first time and is surprised but honoured to be asked to sing in such fine company. This has translated well to these CDs, for they highlight his rich voice and extraordinary control, especially of the extended line common to much of his Irish material. (Some fifty years ago Hamish Henderson pointed out that the ‘bad’ poetry of the much derided William McGonagall was simply that of the Irish/Scots street balladeers he had heard - and made sense if sung in that style, irregular and extended lines and all. This is nicely demonstrated when Kevin sings the ‘cod’ eulogy of Old Ardboe). As will be seen from the track lists, he ranges widely from classical ballad through a fine mix of Irish songs, to a wonderful diddling children’s polka, Miss Mouse’s Ball, that will have you dancing around the room. Ellen sings best in gentle mode, with just the right amount of emotion and ornamentation. She has occasional uncertainties, but overall her voice control, modulation and sensitivity are a delight. You can hear the late Lizzie Higgins behind many performances, and so much the better. As can be seen from the lists, her repertoire is of more familiar songs, but is very wide-ranging in style and content, with nearly every one a winner. She does, however, include ‘art’ songs such as The Lea Rig and Wae’s Me for Prince Chairlie. This latter is one of the many fakes and forgeries by the likes of Burns, Hogg and Lady Nairne that go to make up Scotland’s famous ‘Jacobite Songs’ cycle - produced for the drawing room when the Bonny Prince was safely out of the way and in his grave. Such ‘parlour’ songs require to be sung with ‘expression’; she sings them folk style (where words and music speak for themselves) - and as a result they sound dull. It is a pity that neither singer gives their year of birth, for that can tell much about likely experience and influences, (including whether or not they are pre or post ‘Revival’, if that sort of classification bothers you). Otherwise their biographies are interesting and (mainly) to the point. Although I see I am generously credited with help with some of the references, this was merely adding some gilding to a very fine lily, for the song notes and references are close to the ‘gold standard’ that MT achieved with the earlier Daisy Chapman CD. Firstly, the singers are allowed their say, giving their beliefs about the songs and their sources, together with the folk they learned them from. Then the editor adds informative and scholarly comments concerning the history and derivation of the songs (this doesn’t always coincide with the singer’s beliefs!) together with a useful recording history (including currently available CD versions). Printed and chapbook sources are referred to. ‘Classical’ references are made to song numbers in such as Child and the Greig-Duncan Collection, together with interesting details of the versions that can be found in the Roud Index. This pair of CDs is a bargain from every point if view. In fact, I was so busy enjoying listening to it, this review nearly didn’t get done at all.